Last week, I had the privilege of attending Inc Magazine's GROWCO conference. Every time I get around other business owners, I am reminded about how we have all come so far because of the many people, both team members and friends, who support our visions. I had the opportunity to listen to Shark Tank personality, Daymond John (pictured with me to the right), who had a truly fascinating story about the chances he took and the connections he made (like LL Cool J, one of my favorite artists from back in the day). Daymond attributed a lot of his success to his mother, who mortgaged their house and moved out so he could have the money and manufacturing capability to launch his Fubu clothing company. One of the Inc magazine editors interviewed Jessica Alba, whose vision for her company, the Honest Company, is built around providing ultrasafe household products. But her vision would be nowhere if she didn't have the help of her primary investor and business partner, Brian Lee. He made his money with a couple of other companies, but it was his connections that opened the door for her to create what she needed. Johnny Earle, founder of Johnny Cupcakes (a T-shirt company), spoke about how he built his company up and grew it to 5 stores. He was able to leverage social media to generate the demand that made lines stretch for hundreds of feet on the days he opened his store. But without the help of his parents and some key influencers, no one would know or care about his T-shirts. The story repeats itself with every successful business. No entrepreneur stands alone. Even companies without investors (like GreenRope), require the effort of a community to make it work. Any entrepreneur who doesn't give credit to the many people who helped him get there needs to get his head checked. Just as in other aspects in our lives, it is the gratitude to and appreciation of those around us that fills us with a sense of fulfillment. Starting a business isn't easy. Coming up with the right idea is only the tip of the iceberg. Oftentimes, that right idea changes, as we learn how to better serve our customers and create value in the world around us. It's one reason why real investors don't care about NDAs. It's never about the idea - it's about the people. So how do we find those people? I have been fortunate in finding some amazing people to join me at GreenRope. Many of them are personal relationships founded on years of trust. Others are friends of friends, people who are vouched for by members of our team. It's one reason why we don't have a "Jobs" page on our website. I don't want to open up to just anyone to work here. We are a family, and the importance of having the right integrity, personality, and cultural fit can't be overstated. Picking the right people to be on your team is a good start, but picking your corporate partners is important, too. We have a few technology providers that we work with that help us provide the outstanding integrated service that we do. Olark, FullContact, Twilio, and TowerData are a few in the software realm. It is their reliable service coupled with great people that make it easy for us to offer their capabilities directly within GreenRope. Is it really "Vulture Capital"? This is a question I've heard asked of me for the past 15 years. Are you going to take outside funding to grow your business? It's never quite as easy as they make it seem. Venture capital changes a company, and they're not in it for the same reason the company's founder built the business. For providers of external capital, it's about making a return on the investment. That's why so many of them have earned the "vulture" capital. Are all investors created the same? I don't think so. At least I hear stories about healthy relationships built on that funding. "Smart money" is the term I hear - financing that comes with strategic insight. I recently heard of an idea called "royalty financing", where a company invests money and then gets an indefinite percentage of revenue as return. But no matter what happens, money changes a company. Very rarely do investors just deposit money in an account and then sit back and wait for more money to appear. It's a scary prospect, losing control of your company. What happens if the investor decides that R&D isn't as important? Or, if customer service isn't as important? What if there's better ROI in treating customers badly? It's one reason why GreenRope has never taken on financing. We've been in business 15 years, and as a software technology company, that's a very long time, especially when there's never been outside investment. The upshot of this is that GreenRope determines our destiny, not an investor. 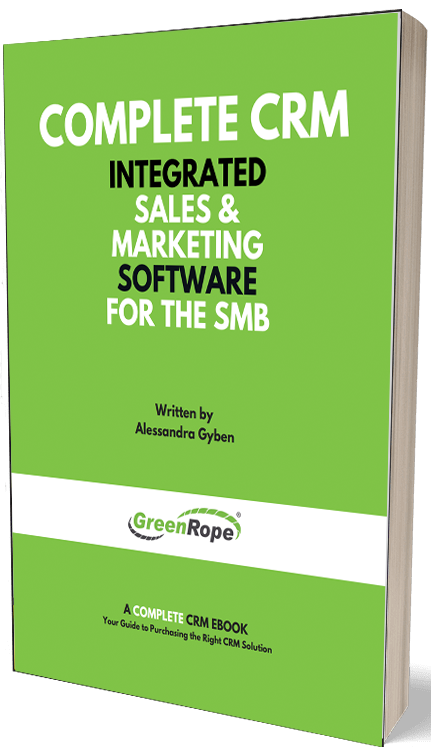 GreenRope as a team was built as a long-term, relationship-driven company. We continually improve our software, primarily from feedback from our users. Half of the company is dedicated to support and education of our clients. We know that when our clients win, we win, so we put them first. Our giants come in many forms. At an early age, it was my parents, pushing me to work hard and not accept failure. Now, our giants are our employees. Our giants are technology partners we rely on. They are our friends, our families, our loved ones. They are our clients, our resellers, and, to some extent our competitors. Until next time, keep walking your path.